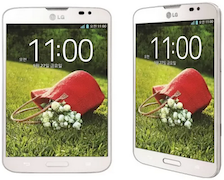 After launching its flagship smartphone G2 last month, and adding a tablet called G Pad 8.3 to its G Series lineup, LG Electronics had now unveiled its next in line Vu phablet. The new phablet, christened LG Vu 3, is the third Vu device from the company, and sports a 5.2 inch display, which is slightly bigger (0.2 inches to be exact) than its predecessor. Here is a quick look at the specifications of the device. You can also read in detail about the G2 and G Pad 8.3 here and here. The phablet has a 5.2 inch IPS capacitive touchscreen display (960Ã—1280 pixel resolution) with an aspect ratio of 4:3 (similar to its predecessors). It runs on the Android 4.2.2 Jelly Bean operating system and is powered by a 2.3 GHz quad-core Qualcomm Snapdragon 800 processor. It has 2GB of RAM and in the internal memory of the device is 16GB. The device will also have a Rubidium pen created especially for Vu, that the company claims would provide better writing without the pen slipping from the screen (basically to compete with the Samsung Galaxy Note's popular S-Pen). It comes with a 13MP auto-focus rear camera with LED flash that can record full high definition videos (1080p) videos and a front facing 2.1 MP camera for video calling. On the connectivity front, the device comes with Bluetooth 4.0, Wi-Fi, 3G and 4G LTE (depending on the region), and it also comes with a micro USB 2.0 port. Additionally, the device comes with A-GPS support and Near Field Communication (NFC). The dimensions of the device are 132.1 mm x 85.6 mm x 9.4 mm and its weight is 1681 gm. The device has a 2,610mAh battery and will be available in white, indigo black and mint colours. Similar to the recently announced G2, this one also comes with additional features like 'KnockON' that enables the phablet to be powered on simply by tapping twice on the display. It also comes with a 'Guest Mode', with which the phablet owners can provide selective access to features to other users. The company has also introduced a QuickView case (made of translucent material) for the phablet, which can display information like notifications, time, date, and messages etc. It will be launched in the Korean market from September 27, but details about an Indian pricing and launch date was not available as of now. LG had earlier launched the Optimus Vu P895 in India for Rs 34,500, and we expect the Vu 3 also to be priced in the Rs 30,000- 38,000 range, considering the specifications its offering. Similar to its predecessor, the new phablet will also compete with Samsung's Galaxy Note series. It will also lock horns with the likes of Sony Xperia Z1 (Rs 42,999) and HTC Buttery (Rs 35,499), among others.